Greetings Portallers! It’s time for a big update regarding the Reforged stretch goals and what we’ve been doing behind the curtains for so long. We’ve been hard at work behind the scenes crafting our stretch goals and making iterations on the site. Below you’ll find a list of the current development items we’re working on. We’re excited to be bringing these new bells and whistles to the site and we can’t wait to see how everyone will put them to use. We know it’s been a while since we’ve had an update blog post so I think it’s about time we come up for some air and talk about the new hotness of Obsidian Portal and things to come. 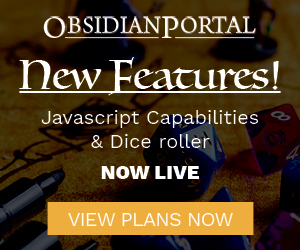 As you all know, on October 28th of this year we unveiled the newly reforged Obsidian Portal and have been working on further improving it ever since. We’ve gathered a lot of feedback from everyone and we’re happy to be such a big part of so many people’s gaming lives!